available in District Collector Office Nagaur recruitment 2018 are 38 posts. Applicants having age limit between 21 years to 35 years are eligible for this recruitment. Candidates with the above essential criteria have to apply for Nagaur district Collector Office Accounts Assistant Jobs before 27-12-2017. Application forms can be downloaded from the Nagaur Dist official website http://nagaur.rajasthan.gov.in/. Closing date to send the application forms with photocopies of relevant documents is 27th December-2017. Selection for this Collector Office, Nagaur Recruitment for Accounts/Junior Technical Assistant Jobs is based on candidate merit in academic Qualifications. 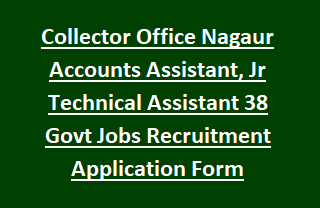 Full information regarding Collector Office, Nagaur Recruitment of 38 Accounts Assistant, Junior Technical Assistant vacancy details, Application form, Important dates, Selection Process, Age limits are given below. Total vacancies has been released in Collector Office Nagaur Recruitment are 38 posts. Total no of vacancies: 38 posts. Qualifications required for Junior Technical Assistant is Diploma/ Degree in Civil Engineering or B.E/ B. Tech in Agricultural Engineering from recognized university or Institution. Qualifications required for Accounts Assistant is CA/ ICWA/ C.S (Inter) passed or B.Com from recognized University or Institution. Detailed qualifications are given in the advertisement. Applicant age should be below 35 years and above 21 years for all posts in Nagaur Collector Office Recruitment. Selection for Accounts/ Junior Technical Assistant vacancies in Nagaur district Collector Office Recruitment is depends on the candidate merit in academic qualifications. For more information regarding Nagaur district Collector Office Recruitment selection process see the notification. Interested/ eligible/ talented candidates may download the application for Accounts Assistant jobs from the official website District website of Nagaur http://nagaur.rajasthan.gov.in/. Fill the basic information and submit to the District Program Coordinator Chief Executive District Council, Nagaur before 27th December-2017.